Auto identify up to 4 pre-set users, provides accurate body weight measurement and Body Mass Index (BMI) on 2.3 inches (59mm) diameter big round shiny LCD screen, with very nice blue backlight, easy reading in the dark. 11 x 9.6 x 0.9 inches small, sleek, lovely design with 0.2 inches (6mm) thickness more pure & higher tempered glass weighing platform. New Sense-ON patent-pending technology gets instant readings when you step on the scale. 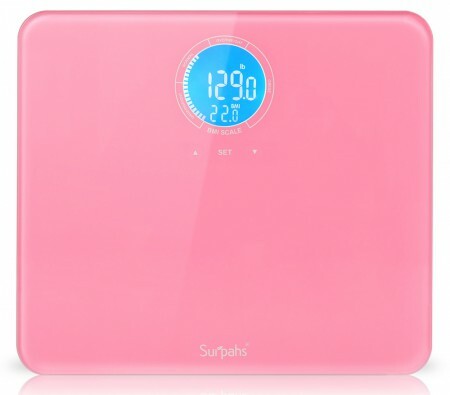 A small, sleek, lovely digital bathroom scale measures your body weight and calculates your Body Mass Index (BMI), it can identify 4 pre-defined users, results are displayed on its 2.3" (59mm) diameter big round shiny LCD, with very nice blue backlight, supports easy reading in the dark. The BMI scale features smart gravity point detect and auto-calibrate. The G-Sensor patent-pending technology embded in 4 TPU skidproof stands support more stable and accurate measurement from 11 lb to 330 lb. New "Sense-ON" patent-pending technology gets instant readings when you step on the scale. 1. Weighing sensors are powered by resistance pressure gauge, to support the most accuracy, please do NOT place the scale on soft surface such as carpet or rug. 2. To determine the accuracy of a scale, please use Olympic weight bars instead of comparing with the weight info from your Doctor, which is NOT supposed to be a "accurate standard". 3. After the scale is moved to another place, the first few weighings may not be accurate. It is backed by 100% satisfaction guarantee.